These easy muffins are sooooo fudgey. I brought them into work, and my coworkers couldn’t believe that gluten-free baking could taste so rich and delicious! Perfect for dessert or as an indulgent breakfast treat. Preheat oven to 350°F. Line muffin tin with parchment baking cups. In a large bowl, combine coconut oil, applesauce and coconut sugar. Add cocoa, baking soda, baking powder, salt and oat flour until well combined. Pour batter into muffins tins and bake for ~30 minutes. Let muffins cool completely on a wire rack before serving. Next Thank you to “Real Food, Allergy Free”! 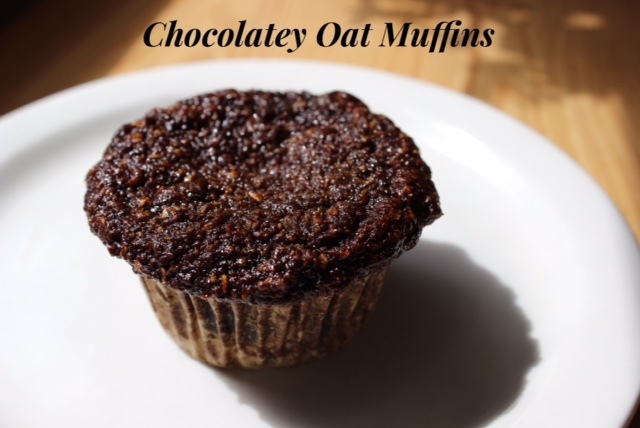 Chocolate oat muffins?! Yes please! 🙂 Looks delish! simple and delish!! Thanks for sharing these…I look forward to trying them! These look so moist and delicious! Visiting from allergy-free wednesdays! Great muffins! Hope you are having a wonderful day and thanks so much for sharing your awesome post with Full Plate Thursday!